Our professional peel-off masks offers unique properties for a variety of facial needs. A cooling therapy that removes impurities, heals blemishes and brightens dull skin with the properties of tea tree and lemon essential oils. For oily to problem skin. Stimulates skin metabolism and helps renew skin cells. Contains alginate, ginseng, spirulina and Vitamin C. Anti-Aging treatment for normal to mature skin types. Gently purify the skin with eugenol, a bactericide made from clove oil. Ideal for normal to oily skin. 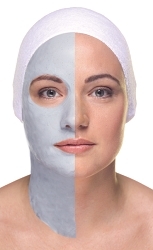 A gellifying mask that contains marine trace elements. These ingredients are essential for supporting various metabolic functions during the renewing process of skin cells and healing of the epidermis. An anti-aging treatment for normal to mature skin types. All righsts reseved© 2016. GIGI'S MIND, BODY & SOUL.